So with the beta release immenent, I thought I would post my challenge. One of the bigger changes to FM this year is the inclusion of Classic mode. Unfortunately you won't be able to use FMC with this challenge as you can't just select one league. Only load the Nation your planning on managing in. No further customising of the database is allowed. Attribute masking should be enabled. 'Add key staff' and ' Add players to playable clubs' should be ticked. Add yourself as an unemployed manager. Call him holiday man if you want. Go on holiday until the reset date of your nation or the day before if your planning on reloading. Add a new manager with your honest nationality and Sunday League reputation. Win your countries domestic top division and win the Champions League. No loans or transfers in are allowed but you can sell and loan players out. If you are sacked, sorry, you have to start again. No international management until completion of challenge. Signing backroom staff is allowed.signing players on trial or signing grey players isnt allowed. Screenshots for anything are encouraged but please post links to your pictures, don't post them as images as it makes the pages slower to load. Posts included embedded images may be deleted without warning. When you join the challenge, could you post a screenshot of your manager's profile on the league reset date. Progress of your club should be documented using this thread, I want to hear the story of your club all the way through. Please keep me updated, even if you are doing really badly. Also, I would like you to Nickname/Tag your best player/s of each youth intake in chronological order. for example, nickname your best player in the intake in season 1 as *their name* YP01. But this is not compulsory if you don't wish to. At the top of the forum, go to 'Settings' then 'General Settings' (on the left). At the bottom, select 'enhanced interface' and save the changes. This will give you access to the extra posting tools that make it easier to post links. Once you've done this, highlight the word you wish to turn into a link, then use the link button (looks like a little globe) to paste in the direct Url to your screenshot. Last year's challenge was very successful despite it only starting in March. I'm hoping that combining England and Europe will lead to the thread being more active in it's first full year. Good luck too everyone who takes part and all I can say is perservere, it will be hard and it will take a while, but as was proved last year it is possible! The challenge started in March of this year when I was off Ill. With nothing to do I decided to create a challenge and realised that there wasn't a small club to big club youth challenge. Later on in the year I decided to extend the challenge to Europe and created a new thread for it. Over both threads there was almost 3000 posts, not bad for a CSE debut in March. I'll be giving this a crack this season definitely, thinking Holland, get the youngsters playing my own brand of total football! which one you doing first ri916?? ooops Answered my own question! Anyway - Reserved! It might be worth adding the newly promoted teams for the lowest divison of each of these countries to avoid confusion (it isn't easy to find out who got promoted in some countries). I am starting the challenge today, just deciding on a team right now. Also, what's with the Reset dates? Are we supposed to start in June 2014? You holiday a year so it will be in summer 2013. The newly promoted teams change everytime you holiday or reload the game. To find out who they are for your game you holiday to the reset date and then select the country you loaded from the menu at the top and select 'season report'. 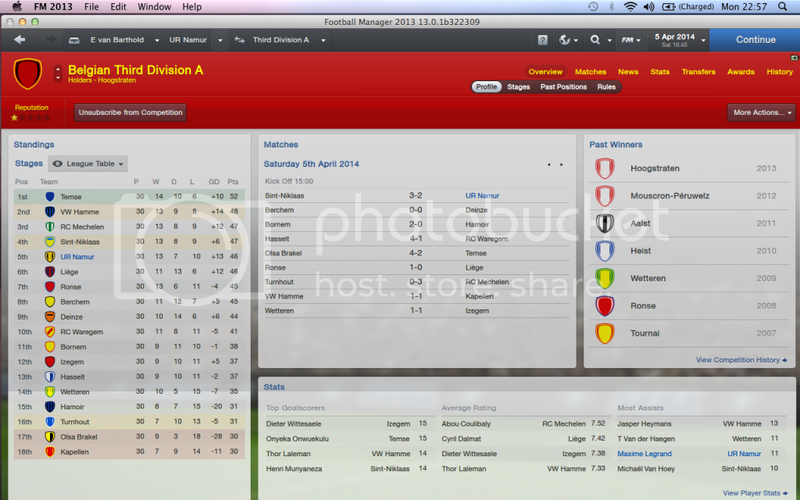 Or that's how it was on fm12 anyway. Good luck! Yeah, I know. Still looking at the old thread I will need at least 2025 to complete it so it might take a while considering how much free time for FM I have. Anyway, should be fun as I've never done one of those. Will keep updated. Installed and setting up game. Will run through the first season here soon and should be ready to pick a club tonight. Will definitely be doing it this year. Unlikely to start with BETA because this is such a long term project you have to be content with the game etc before trying it IMO. Also ri916, few issues with your opening post, what exactly is the point in renaming the Youth Players? Just looks ugly and pointless to me. Also, I see you have allowed backroom staff to be brought in, personally I won't be doing that - the challenge originated with the rule being the only staff you can have being players that had retired from your side. This personally is much more satisfying and also means there is a use for older players who you start with. 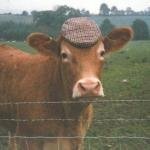 Finally I see you have encouraged seasonal updates - Should we not be updating very regularly when possible to keep interest in the thread alive? as we know this is a VERY hard challenge, the hardest ever made on these forums and you have to keep fun and interest in by that interaction you get with more regular updates. That's all from me. KUTGW ri916 in keeping this challenge alive the last few years. Looking forward to it. what exactly is the point in renaming the Youth Players? Just looks ugly and pointless to me. I tagged mine by year plus a letter ... I found it nice, after a while you forget exactly when players came in and it's a bit of a "Oh wow, this guy is tagged as YP17a and it's 2027, has he really been here 10 years already?" It was also very helpful when looking at the youth team to have some visual distinction between guys I signed to be first teamers and the filler: in the early years I found I regularly had to reach into the youth team to fill places in the first team. Certainly it's a matter of taste, but I think I'll be keeping it as something I do (even in games where I can sign players). Although in the future I'll only be doing it "LastName (tag)" rather than "FirstName LastName (tag)" because full names did get a little messy looking on the pitch. I found in last year's challenge I could play a season in ~12 hours of actual playing time (at least in the lower divisions where you really only have league games to get through), but then writing the end of season update could easily take me 2-3 hours by the time I got all the screen shots linked and everything. I certainly wouldn't want to go through the effort of doing a write up any more often than once a season - anything more and I'd have felt like I was writing about a game more than playing it. Also I think once a season is ideal for reading about other people's games too. NOTE: To get youth players you may need a Head of Youth Development. Make sure you turn off his ability to make offers for young players though! In, will probably go to Germany this time around. Ok, finally had a chance to holiday the first season away and start looking for a club. Of my options, I narrowed it down to 2 choices until I loaded up the logos and then noticed the club nicknames. Hoping to get some playtime over the weekend and get to grips with the different looking Belgian Lower League promotion / relegation set-up and this very lopsided squad I have inherited. A lot of retraining is going to be necessary. Full intro post will follow once I get to sit down with the game and progress past my first day on the job! I'll be giving this a go once I get hold of the game, had the most fun / success in Italy last time round, so will probably start off there. ri, we don't need to add players from nations and stuff do we? We can just have the English leagues and then the Regional Premier Leagues right? Couldn't resist. Despite thinking about doing a different challenge this year (even sort of beginning one) I've decided to have a go at this and see if I can actually complete it this time. Like Braumiller I'm starting in Belgium but for me I will be starting with UR Namur, a Semi-Professional team worth little less than 300k. Here's the manager's profile, should be fun! TWFL- Good luck in Belgium mate! Nope, but, I don't see the need. That was the other club on my short list of 2!! Braumiller thanks! I'm finding it much tougher than expected, desperately needing an Intake. Well this is going to be an interesting start. Positive - In a complete 180 from my FM12 version of this, I start with 2 quality GKs. Took me 8-10 years to get one first time around! Ok so I have had a shocker. Sacked mid-November sitting second bottom of the league. Things just would not go right for us with injuries to key players and matches being lost late, late on despite being a couple of goals up. Anyway not giving up on this yet. I have started again already and this time with the exact same team. I have a better idea of the best formation and what certain players are like so I should have a much better go at it. I'll let you know how it goes..
Edit: Just played a cup game (which we lost last time around) and won 4-0 away from home. Things are already looking up! After a crash dump in my Big Euro Challenge save i decided id try this , although im not show if ill get very far, it looks pretty difficult. Edit: Just saw the club signed a GK on the 17th June, is that ok or should i restart? Giving this a go in Germany. TWFL- Unlucky mate, hopefully things will work out better this time around. I think ill try this challenge when i have a solid tactic. Cheers for the reply guys, I understand I may have come across a bit arrogant with that post. Yeah I totally agree Shakes, one big update at the end of the season is obviously the key, I was more hinting at coming in and posting just random updates at interesting moments into the game - give people more of an insight into your save and help get a proper feel for what your experiencing. Not just a particularly youngster doing well, it might be you have a random flair player who may not be very good but produces the odd moment of magic to win you games, or drawing a big cup tie - It's all great to hear about. My personal update style is to firstly introduce the club, what our squad is like, what I think my first XI and formation will be, the strengths and weaknesses, and little interesting bits about the club. And what my targets are in a first post, then another mini update after ten games, then frequent little dots of info (moreso if it's a particularly interesting season) throughout before the final update. But yeah ri with all the euro leagues involved hopefully we can get it really going, already some good interest in this. I don't think I'll be starting until the game proper comes out, too many bugs at the moment. Can't wait. Not worries, I don't have a problem with people updating like that, I just wouldn't want people to think they had to. Overall the starting squad wasn't too bad, but I made some errors which I will explain in my next post. PS: Is there a problem with the image-linking service as all I get with any image I try to link (i.e. Logo) I get Invalid URL notification? Any ideas? As I mentioned we were predicted to get relegated once again but despite that we finished 8th. Kiel actually started the season very miserable while I was learning my way round the new game and getting the tactics working (along with some morale boost and improved match preparation). As I result we climbed up to the top half of the table in the second part of the season. The top players in the team were my main striker Marc Heider and the only winger in my tactics Jaroslaw Lindner. The best defender was my left back Gerrit Pressel. 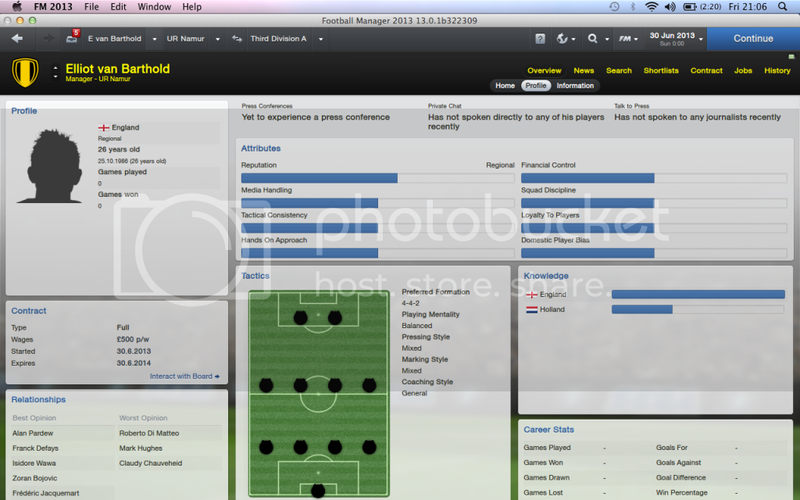 Winger Alex Kwame (YP1) who was already signed at the club when I arrived. Defender Robert Braun (YP2), who I judged to be the best prospect from my first Youth Candidates batch. Other prospects include defender Jonatan Voss and goalkeeper Jovica Ljubojevic. Unfortunately, my team has several very big problems - finances the main one. Although I kept my wage bill at around 50k p/w with budget of 73k p/w, I was leaked money like crazy. I believe we finished the season with 96% of revenue in losses (2.6m if I am not mistaken), which inevitably means much lower budget next season. Unfortunately, this is not due to a large squad as I already sold some players to get the bill down so I am pretty much stuck if I want to have sort of decent first 11. 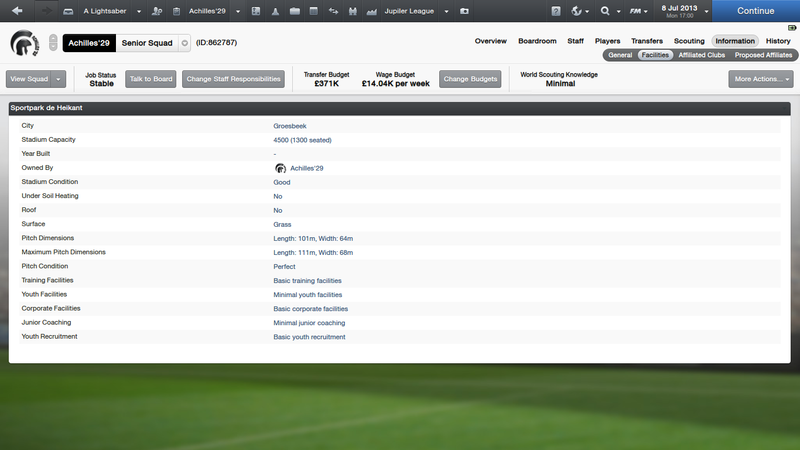 With that in mind, I can't use my Youths under age of 17 so for next season I will have a very short squad. On top of that, the squad is aging, with just a couple of players under 23 (4 per game required), so I have to use 2 of 7 of my substitutes on fake players to fill the squad. Very troublesome indeed and if an injury crisis hits us next season, we are in big trouble. Anyway, I am still hoping to somehow improve on my 8th position but it will be incredibly hard with the great lack of resources to cover first team wages. alexyfoot- Good luck at Kiel, solid first season there. It came immediately after the last game before the winter break and we were 7th in the league. Our chairman is certainly after quicker results than the challenge would lend itself to, but that is a challenge I want to beat! I have restarted the challenge with ROCCM again. Lessons have been learnt and a new approach is being taken. After getting crash dumps in my dafuges game I've decided to give this a go. Going for Belgium to see if I can do this. Loading up now. 'Finished' 8th at the winter break and I was let go. Started out great, WWWDDWWDDW and I was 2nd after 10 games (level on pts with 1st. Then injuries and bad form hit and it was a mess. Being 8th just over halfway through the first season of this challenge (in an 18 club league) would ordinarily be fantastic, but the (unnaturally, in my opinion) high expectations of the chairman make for ROCCM to be an extremely difficult task. Currently holidaying again and I will pick a smaller, no expectation Belgian team this time around. 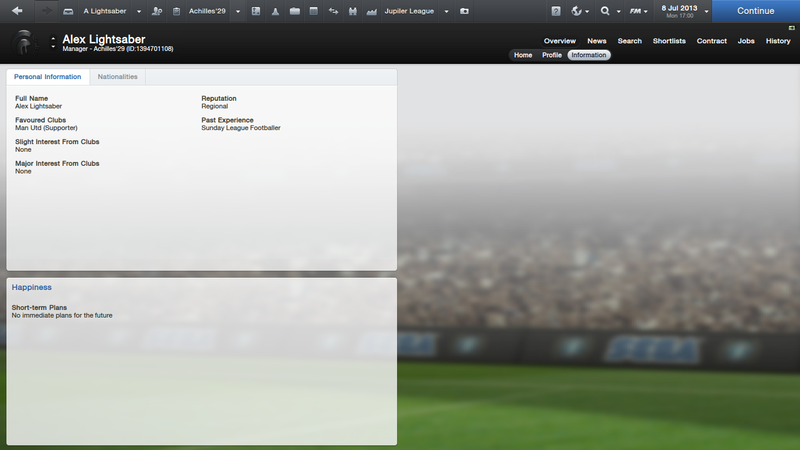 OK, I've taken over RFC Liège and this is my profile. I've got no staff so I kinda have a hard time finding out what kind of players we have. Wish me luck. I see there are two transfers agreed already when I took over the club. May I use these players or should I try to get rid of them asap regarding to the rules? I had a similar situation and decided to keep them as they were signed before my time, so nothing you could do about it. 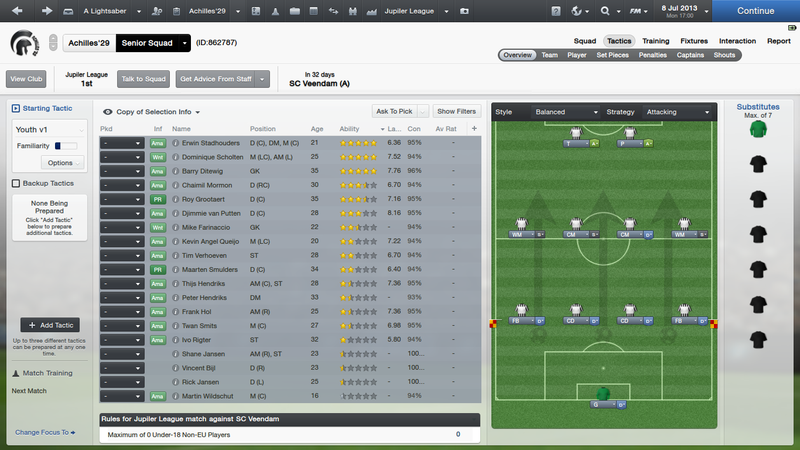 Good luck with Liege, they are currently 3rd in my save mid-Feb so should be a decent choice. Sure thing. So far it's not looking good, lost my first 3 friendlies, but working on a formation I think'll fit. So should get better as we go. Unlucky Braumiller - seems very harsh that, almost bug-like; Why were the expectations so high? For any smallish club that has just be promoted surely survival is the priority or maybe a lowish-middle position surely! Was it anything to do with the board's demands ie. the style of football? Getting tight towards the end of the season. Currently residing in 5th in the league with 4 games to go just 1 point off 2nd. Going to be a close finish! Working through pre-season tonight with my new team! Does every Belgian team have royalty overtones in their names? Hmm... I'm not sure Liège is a good club for this challenge. The board has high demands. I'm currently sitting 4th, and the board are disappointed! They expect promotion in our first season at this level. I'm also struggling with the league rules. In Belgian 3rd tier you can only have 4 subs, at the same time at least 2 of your players have to be under 21. The team I took over had a grand total of 0 players under 21. This mean I can only have 2 subs for each match in order to comply with regulations. I can't wait for the youth candidates to come through so I at least can fill up the bench. That is, if I can keep my job until then. If I'm fired I'll try to go on holiday until the end of the season and try to apply for a job with one of the new teams promoted. If that fails I'll start over. Wish me luck!